← The heat goes on . . .
Don’t you love it when people are professional about their work? Troy, the plumber, arrives on time at 7:30 this morning, gets the job done quickly, cleans up, doesn’t overcharge, and is pleasant to deal with. Thank you very much. I’m happy because I can mark off one more item on my to-do list! Actually another item comes off the list today. I’ve been intending to send this blog to an internet “cloud” so I have a back-up. A thoughtful reader made this suggestion to me in the comments section several weeks ago. I finally took care of that today. I’m using DropBox (free!). I hope it works. I need to find that reader’s email address and let her know. She can get extra storage space for free for referring me. I was able to take some pictures of Bridget today. If you click on her page (in the header), you will see her new slideshow pictures. Of course, she looks like she’s expecting me to stab her in the heart. Why? I can’t explain, except to say . . . That’s Bridget being Bridget. Suddenly she hates having her picture taken. Remember when I wrote about Spike getting out of his harness during a rest stop on our Florida trip? He smells something in the direction of the highway, flips himself through a series of contortions until loose, and takes off like a shot in typical, fixated terrier fashion. It takes some pretty loud screaming on my part to get him to stop. He’s done this Houdini act before. Usually it’s when he wants to run with another dog or he smells something interesting, like fresh (or not so fresh, for that matter) roadkill. 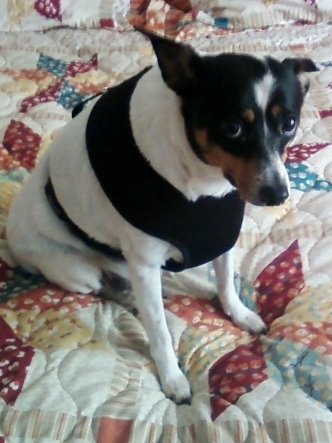 No matter how tight I make the harness, Spike can get out of it. My sister Nancy suggested I try the mesh kind like her Margaret has. Hmmm. Good idea. The comfortable design will allow me to tighten it more than the other kind that digs in. I find one at the local pet store for $16.95 (owie!). Seeing my twenty-dollar bill decimated at the cash register, I tell myself what price is too high to keep Spikey safe? Although Bridget doesn’t need a new harness, I get her one, too, for comfort’s sake. And my purse seems to have holes in it these days anyway. Geez. First thing home the crew tries it on. It fits both of them! This is a day for miracles! P.S. You can order harnesses like these by clicking this link: Amazon.com dog harnesses Remember to order a larger size than usual as they do run a bit small. You look so handsome in black, Spikey! This entry was posted in Bridget The Widget, Getting Ready To Go, Spike The CoPilot and tagged dogs, DropBox, getting ready to go, rat terriers. Bookmark the permalink. I’d never want her on my jury! What gets me is she gets more cuddles and preferential treatment than Spike or Janie. Because she acts like a big baby I tend to treat her like one. And this is the thanks I get! The crew look good but I LOVE the quilt. Did you make it? The crew does look good! The quilt is a cheap storebought thing, very photogenic though. I bought it for the colors. That is $16.95 well-spent. Not only for enhanced Spike safety but also for the mortal humiliation apparent in the photo. I like this BLOG because you use words like “decimated”. I also like roadkill. Another word-lover . . . I like the way the English language plays tricks, too . . . How do you like your roadkill? Grilled or fried? Bridget is still cute in those pictures no matter the look you seem to be getting. Hope the harness keeps little Spike safe. I need to get one of those for Chancy and see if he would stay in it. Hugs and nose kisses all around from all of us. 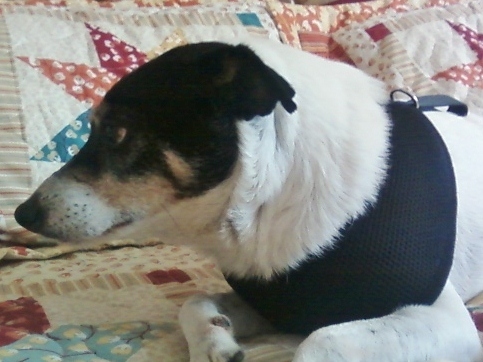 The other harness has straps and I think that makes it easier for Spike to get out of it. He pulls against the leash which makes the harness move up toward his head. Then he can wiggle his elbow under the strap. Once he gets one leg out, he’s out of the harness in a flash. The new harness is so wide I don’t think he’ll be able to get his elbow up past it. We’ll see . . . I know you won’t like this, but get a choker chain. The harder they pull the tighter it gets. Choke my Spikey? Have you looked at how cute he is? Never! A choker chain defeats the idea of an enjoyable walk with the dogs if Spike is coughing all the time from near-strangulation. Nice of you to try to help.